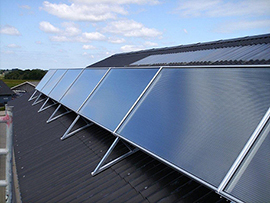 Solar air collectors with high reliable performance - SolarVenti Ltd. Since the SolarVenti ’breathes’ into the filter through the many hundreds of holes distributed across the aluminum back plate of the panel, the intake has no ‘vacuum effect’. The air is drawn in quietly through a large surface towards the small holes, and therefore only draws very little dust into the panel.The quiet air stream towards the many intake holes in the panel further means that heat from underlying wall- and roof-surfaces are drawn in to a large extent and are used inside the solar panel..
SolarVenti’s internally developed SV Regulator Unit improves the performance of the solar cell further by approx. 15-20% because the SV regulator is specifically developed for 12V solar cell operation. The small computer of the regulator will – in relation to the energy of the actual installation – continually maintain an optimal work tension inside the power-producing solar cell.This electronic regulation of the way that the solar cell works causes a marked improvement of the ventilators’ performance, and therefore of the total performance of the system. 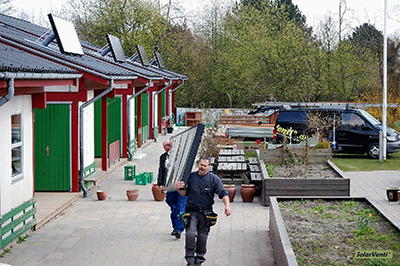 SolarVenti has experience with almost 60,000 systems in the field – both in countries as far north as Greenland and Lapland and, at the other end, Southern Europe and Australia with the toughest sun conditions.